When you’ve just experienced a surgery you need a garment you can trust during recovery. The First Stage Support Girdle with Suspenders and Short Legs by Marena Recovery is a post surgery body suit whose comfort and quality show why doctors and patients depend on it especially as a liposuction recovery body suit again and again. These kinds of post-surgical compression garments are commonly worn after many different kinds of surgeries. The compression, or strategically placed pressure, of the garment helps keep swelling down while promoting tissue re-adhering normally during your recovery process. Compression may also reduce pain and fluid retention which can decrease your healing time and build-up of scar tissue. 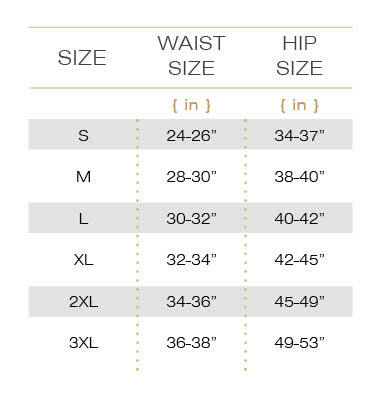 When shopping for compression garments you will sometimes see the terms “stage one” and “stage two.” This is a stage 2 compression garment which means that it has a little more compression and, is sized slightly smaller than a stage one garment. This item is constructed from F5 certified fabric. Its pull-on style is preferred for the latter period of the recovery process. It’s an ideal garment for a lower-abdominal procedure, liposuction in the abdomen area, buttock lifts or tummy tuck. This girdle is zipperless and has an open bottom design. This underbust style item extends to the level of the mid-thigh and includes adjustable elastic straps and a high back. Lace lines the leg openings and elastic trims the rest of the pieces. The fabric utilized in fabrication is antimicrobial, insuring that garments like the First Stage Support Girdle with Suspenders and Short Legs by Marena Recovery keep their shape and performance for as long as you need them.